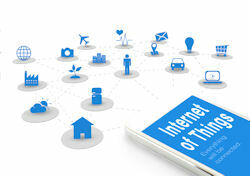 How will IoT devices or systems cope with the crowded network? It is estimated that there are already 14 billion objects connected to the Internet, so that is currently more than 2 devices per man, woman and child in the world today. Industry analysts are projecting that this could rise to anywhere from 20 billion devices to 100 billion by 2020 and if IoT really takes off in a big way with more connected cars, more wearable tech (both for recreational and healthcare monitoring purposes), and more connected buildings etc., it is easy to see how such growth is going to be achieved. Some may suggest that even 100 billion connected devices is a bit on the conservative side. In most cases, these devices will act as sensors and, individually, only demand relatively small amounts of network bandwidth to communicate small amounts of data. However, when you scale this up to many millions or billions of connected devices, the demand on the network becomes huge. Of course, we can expect network capacity to continue increasing but can it realistically keep up with demand to the point where every single device will enjoy an unhindered network experience? I think not. We just have to look at the situation with our home networks. Over the years, our ISPs have doubled, tripled, quadrupled the bandwidth delivered to our homes and yet we still receive complaints (mainly from our offspring) that “the internet is slow” as they try to stream a film, participate in online gaming, Skype with friends etc. The reality is that we very rarely get anywhere near the full bandwidth promised by our ISPs because the network has to be shared with the other subscribers around us. Now, add in the steady increase in the number of devices we have added to our own wireless networks, first wireless printers, then laptops and smart phones, then tablets and smart TVs. So, a bit like adding an extra lane to a motorway, initially, we enjoy better connection speeds when our ISP ups the available bandwidth but then we add more devices to the network and the benefit is short-lived. Now, if IoT does come to full fruition, we may well be adding another 10 or 20 devices to our home networks, all competing for limited WiFi connectivity. Consider this situation at a national level: There is going to be a huge proliferation in the number of devices, all vying for the network. So, accepting that network demand is probably going to outstrip supply for the foreseeable future how can IoT device and systems providers ensure their connected objects are going to work well over congested and contested networks? Well, no matter how elegantly a device is designed – no matter how well it performs within the safety and comfort of the test lab – it must cope with the issues of operating over real and potentially hostile networks. Devices that cannot tolerate adverse network conditions will result in frustrated customers and damaged reputations for the supplier. What will separate many of these devices from even our mobile phone experiences is that they will be operator-less. Unlike a mobile app where, if it doesn’t work, you might change location or even network, these devices and their centralised controlling software will have to implement a strong autonomous recovery approach in the event of the inevitable network issues they will face. In order to achieve this tolerance or resilience IoT suppliers need to accept that they can’t improve the public networks over which their connected devices will need to operate but it is in their remit to improve their device’s tolerance and resilience by first fully understanding how it performs in the real world networked environment and knowing the point at which the device is likely to fail. If they are armed with this information, at every stage of the development and deployment process, they will be able to engineer tolerance or resilience into the final product and iTrinegy’s virtual test networks provide the ideal testbed in which to properly assess and manage risk throughout the development and deployment of your IoT systems.